Things to See in Central Park, there are dozens of major attractions in this New York City Park. One day is not enough to explore them all but you can try and explore the top ten things to see in Central Park. The sixty feet long Bow Bridge celebrates Classical Greek refinement architecture. Calvert Vaux designed the bridge along with Jacob Mould and it was constructed in mid nineteenth century. Bow Bridge has been featured in films including Manhattan, Keeping the Faith and The Way We Were. It is just three hundred meters northwest of Bethesda Terrace. Bow Bridge is made from cast iron and the walkway is ipe, which is a hardwood found in abundance across South America. The wood tends to develop a deep red hue when it is wet. Known for amazing views of Fifth Avenue and the picturesque landscape, Bow Bridge is definitely one of the top ten things to see in Central Park. It is around five hundred meters west of Bow Bridge, between 74th Street to the north and 71st Street to the south. The two and a half acres lush garden is dedicated to iconic peace activities, musicians and singers including John Lennon and The Beatles. Lined with shrubs, rocks, flowers and elm trees, the quiet zone was designed by Italian artists. The Strawberry Fields are a symbolic protest against war. The nearest entrance is near 72nd Street, across Central Park West. The Ramble is a wild garden, lush woodland with thirty eight acres of winding paths around there hundred meters northeast of Bow Bridge. The trails with distinct flora & fauna offer convenient access to a few other major attractions in Central Park, such as Bethesda Terrace. The Ramble is popular among birdwatchers. The woods are home to over two hundred species of birds. Naturists would love this place filled with Black Locust, Black Cherry, American sycamore, oaks, the Hackberry and Kentucky coffee tree, Cucumber Magnolia and Yellowwood, Sophora and Phellodendron. Alice in Wonderland is an eleven feet bronze sculpture adjacent to Conservatory Water. Alice, as described by Lewis Carroll, can be found here with Mad Hatter and White Rabbit. Designed and constructed by Jose de Creeft in 1959 using funds granted by George Delacorte, the sculpture is primarily an attraction for kids, who are welcome to climb and crawl over the sculpture. 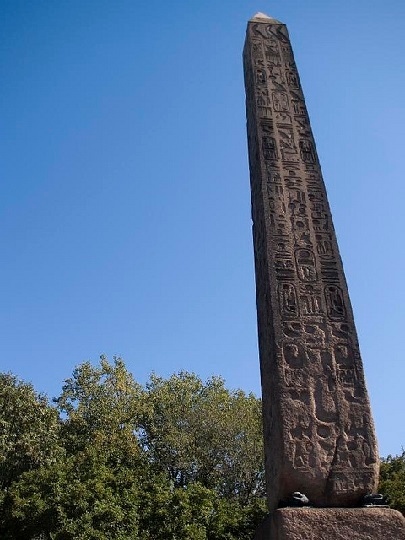 Obelisk or Cleopatra’s Needle is an ancient artifact dating back to 1450 B.C. There were two such obelisks that were moved to Alexandria from Heliopolis. Subsequently, one of the two was moved to New York City and another was moved to London. Situated just west of the Metropolitan Museum of Art, actually behind if you are taking the entrance at 5th Avenue, the Obelisk is definitely the oldest man-made feature in the park. The seventy one feet tall structure weighs around two hundred tons and it took four months for laborers to move the artifact from Hudson to its present location. The Reservoir, also known as Jacqueline Kennedy Onassis Reservoir, spans a hundred and six acres. The water body has a mile and a half long track encircling it, which is quite popular among joggers. The Reservoir offers an immersive view of the skyline of the great city and it is also popular among birdwatchers for they can spot egrets, herons, loons and coots. The Reservoir was originally a source of clean water for New York City but it no longer serves that purpose. However, it does provide water to the Lock, Harlem Meer and the Pool. The Lock was originally intended to be a large lake but it has transformed into a narrow stream today. Nevertheless, it is one of the most tranquil places in Central Park. Birdwatchers can rejoice and so can anyone looking for an idyllic time in a busy city. Developed by Vaux and Olmsted, the Lock is half a mile west of the Museum of the City of New York. Bethesda Terrace is around three hundred meters southeast of Bow Bridge. There are many attractions nearby including Bethesda Fountain, Cherry Hill Fountain, Bethesda Arcade and The Lake. 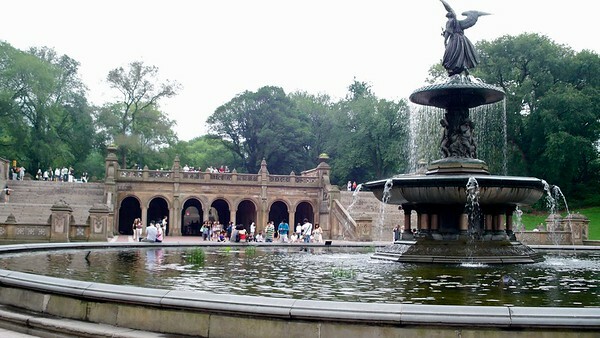 Bethesda Terrace was one of the first features to have been completed in Central Park. Construction started in 1859 and was completed by 1863. There is an upper terrace and a lower terrace with grand staircases. The structure is made of New Brunswick sandstone, the steps and landings are granite and the paving is of Roman brick. The terrace was designed by Calvert Vaux and Frederick Law Olmsted. The place was intended to be the heart of the park, where people could get together and socialize. Conservatory Garden is less than two hundred meters from the Museum of the City of New York. You can explore the garden from 8 a.m. till sunset. The formal garden has a calm setting. There are no bicyclists or joggers. You can take leisurely strolls here, explore the natural grandeur of the seasonal plants and if you are lucky to be here when the flowers blossom then it would be one of the rarest experiences you would have in the city. Belvedere Castle is adjacent to Turtle Pond, half a mile west of the Metropolitan Museum of Art. The place is open from 10 a.m. to 5 p.m. with the exception of Christmas, Thanksgiving and New Year’s. The castle offers majestic views of Central Park and you can spot Delacorte Theater, the Ramble and the Great Lawn among others. The castle was not developed bearing in mind any specific purpose. It was simply designed to be a fascinating backdrop with splendid views. 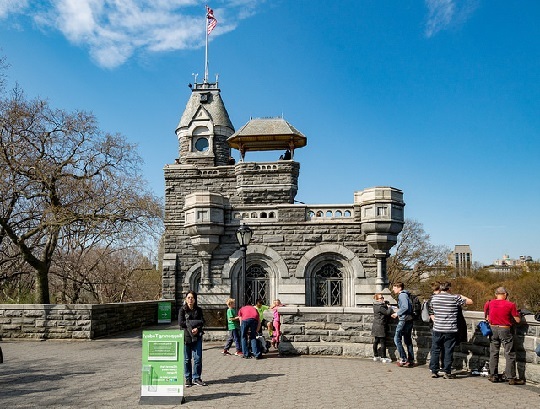 However, Belvedere Castle is used for various purposes today, both for public and private events. The best way to explore the top ten things is by Central Park Pedicab Tours. And Gossip Girl Tour can save you time, the ride would be convenient and the whole expedition will be affordable too. Memorable New York Getaway – For many, travelling to a big, busy city like New York with kids may seem like a daunting task. Below are a few tips that will help you minimize the anxiety and maximize the fun along the way. 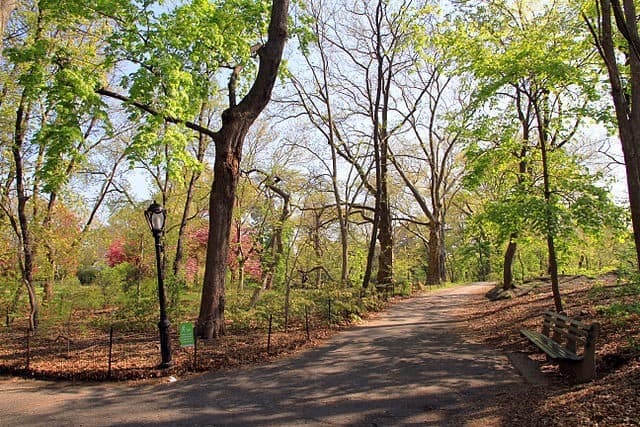 Start your Big Apple vacation by visiting a park. You could possibly take your children to Flushing Meadows the same day you arrive at NYC. Here, they will have an opportunity to relax as they explore the Queens Zoo, Citi Field, the Queens Botanical Garden and six playgrounds. Apart from your children having time to relax, you also get an opportunity to interact with the locals and get some important advice on what to see and do in New York. Talking with locals will also give you an idea of where to find valuable treasures that are less known in the tourist circuit. When traveling to a big city like New York with kids, it is preferably better to rent a home via Airbnb. The main goal being to fine a family-friendly flat in a great neighborhood. While staying at a hotel is nice, the luxury will definitely get lost on your kids who find the greatest joy in the simplest of things. Staying at an Airbnb flat makes it much easier for kids to sleep in their own bedroom, giving mom and dad time to relax. 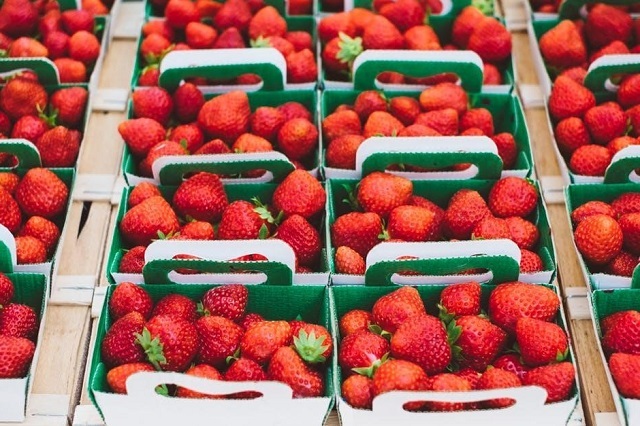 One of the best things to do with your kids in the city is to visit the local farmers’ markets for vegetables and fruit, yogurt and cheese, pastries and bread. Head home to make a simple home meal. This not only gives your kids the chance to gain that real New York experience, it is also less expensive, more relaxing and healthier than dining out every night. The last thing you want to do is to waste time in a city where you will be for only a couple of days. One of the best ways to experience NYC is by taking long walks. You can also schedule a hop on hop off tour bus that makes it easy to plan your city adventure. If you are looking for a more relaxing environment, you can explore the various parks in the city by renting bikes. However, remember that kids tend to get hungry after an entire day of walking. It is a good idea that you bring along a few snacks, as well as sunscreen, hand sanitizer and antibacterial wipes. Kids love the outdoors, but it may not be so much fun when it is all wet and cold. In addition, summer is a great opportunity to do something indoors while taking a break from the sun. In New York, you will find a great assortment of incredible natural history and art museums that your children will enjoy visiting. However, let your children take the lead and go at their pace. Look for exhibits that have a hands-on approach and ask your kids what they want to see next and skip the rest. Before stepping going, find out how much it is going to cost, if it’s appropriate for kids, and whether you can bring along a backpack or stroller. Once you get back home, talk about the trip. You can even help your kids choose pictures to hang or create a scrapbook with pictures of monuments and museums from tourist pamphlets you collected during your stay in New York. The scrapbook will act as a summary of each day of your trip, including the food you ate, places you visited and friends you made along the way – a great way to remember a vacation! Folk, roots, old-time revival – whatever you want to call it, there is something stirring in the music dens of New York. Encompassing bluegrass, old time, blues and more, the music and melodies are woven into the fabric of a rich American culture. But don’t think of it as static, stuck in the past, or confined to the hinterland. The Coen brothers are tapping the scene for their anticipated film ‘Inside Llewn Davis’ due out next year, whilst bustling New York has plenty of places to run the hoedown, tap the washboard, and find a bit of country in the city. New York flights are also cheap and widely available, so if music’s your thing why not plan a visit to the Big Apple? If it’s big venue entertainment you’re after and you want to explore the US’s rich blues heritage, check out the free live music every night at Lucille’s Grill at BB King Blues Club and Grill on West 42nd. You’ll find local talent performing soulful blues, and there’s great food on offer too. Plus it’s on Manhattan Island itself, so it’s a great way to wind up a day out downtown. Small venues which are not only intimate, but where you’ll find communities of artists and musicians happy to share their knowledge and passion with you, particularly if you’re doing more than just passing through. Expect a variety of up and coming acts, genuine undiscovered talent and a feeling of being right at home in the vast metropolis. brick and cobblestone in a basement, and lots of surprise performances. The club used to charge $10 for entrance and folk would bring their own drinks to stay and play until dawn or until they fell asleep. Now you can pick up a drink there too, but the cover charge still lasts until closing so you can enjoy their jam sessions from just after midday until 3 am. The endearingly named Jalopy’s Theater, as well as running all kinds of classes with the most friendly, skilled and talented teachers you might find anywhere, is literally a prayer hall for talented fiddlers, pianists, and more, with wooden pews facing its theatrical stage. Roots ‘n Ruckus nights every Wednesday give you a free taste of the most authentic folk in New York City, with tub-basses, kazoos and harmonicas galore, but they also have ticketed events hosting talents such as Cynthia Sayer and Paul Geremia. There’s also a café, and an instrument store in case you get really inspired. Whether or not you want to watch or join in, the acoustic Old-time Jam with Alan Friend every Tuesday at Brooklyn Farmacy Soda Fountain is a friendly place to enjoy music. The place’s motto, “fresh, friendly, local” could be said to apply to its music just as much as to its artisanal foods and selection of sodas. They also offer some great desserts in this charming historical venue. In fact, it’s a great place for a sweet treat for the whole family during the day. They also have other family-friendly events from time-to-time, such as morning jams and sing-a-longs. If you’re inspired and want to get involved, you can try learning an instrument. The classes at Jalopy’s cover everything including klezmer fiddle, off-beat banjo tunings, Kentucky fiddle bowing techniques, country harmony singing, ukulele, mandolin, and banjo stylings. You learn in songs, in groups, and can rent an instrument too, which is particularly handy if you’re just trying out. Alan Friend who organizes the jams at the Farmacy, teaches banjo, guitar, concertina and fiddle. Also at Jalopy’s is the New York City Barn Dance. They teach and walk-through all the dances, so you don’t need to know before you go – but it’s not a class. Everybody’s keen to get on with the dancing and they welcome participation regardless of experience. Probably the most fun way to learn a staple of American culture, and listen to the calls of the traditional square dance. 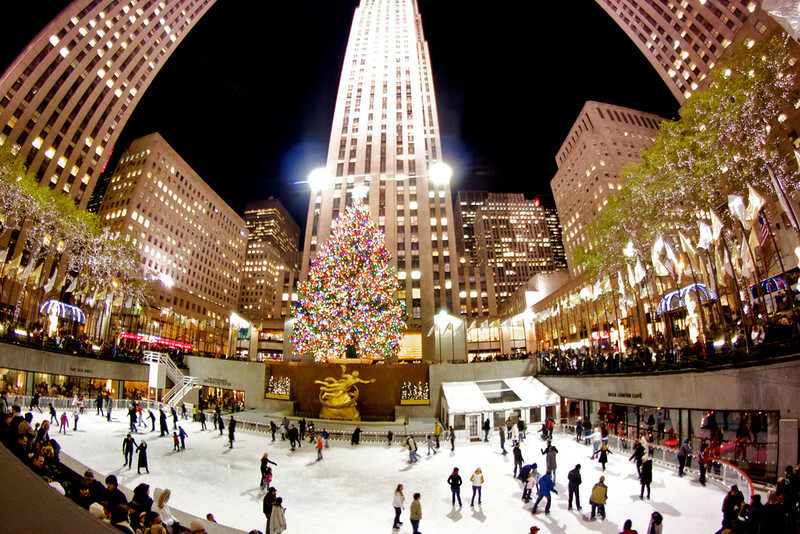 New York City is probably the most popular destination for the Christmas holidays. There’s so many events in the city it might be hard to enjoy them all, for example, the traditional Nutcracker Ballet on Broadway is a big must. The ballet has been around for many years and continues to be a Christmas favorite for many. Tradition holds true with the “big tree” lighting at Rockefeller Center. This traditional tree lighting ceremony takes place during the first week of December. Don’t forget to stop by Central Park for some ice skating and Radio City too as it continues to put on the Radio City Spectacular each year. Enjoy 90 minutes of dance, song and comedy while visiting New York City. And for sure you will want to enjoy shopping in New York City.